Up until now, the loop statements set up have been allowed to use the conditions inside them to determine when they are terminated. 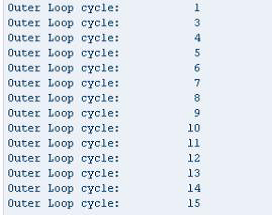 ABAP also includes termination statements which allow loops to be ended prematurely. There are two categories of these, those which apply to the loop and those which apply to the entire processing block in which the loop occurs. First, we will looks at how to terminate the processing of a loop. The first statement of importance here is the CONTINUE statement. This allows a loop pass to be terminated unconditionally. As the syntax shows, there are no conditions attached to the statement itself. It tells the program to end processing of the statements in the loop at the point where it appears and go back to the beginning of the loop again. If it is included within a loop, any statements after it will not be executed. For the simple DO loop ,include an IF statement which includes CONTINUE inside it, like this. With this code, the second iteration of the loop (when the sy-index field, like the value of a, will read 2) will hit the CONTINUE statement and go back to the top, missing the WRITE statement. When this is output, the incremental counting will go from 1 to 3. As with many of these statements, in debug mode, the operation can be observed more closely by executing the code line by line.